The first civilian governor of Adamawa State, Abubakar Saleh Michika, has died, according to a report by Vanguard. 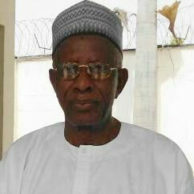 The former governor who has been in coma for several days at the Federal Medical Centre, Yola, died yesterday night. His son, Hafiz Saleh had lamented how the state authorities neglected his father by refusing to give him appropriate medical check-up. He said the state government had also refused to pay his pension. “The doctors say he cannot be moved until he is stable. For three days now, he has been in coma and there is nothing we can do but to pray; if they had allowed him to seek medical check-up, this would not have happened,” the son said. “Do you know that my father got only one car from the government, despite the fact that he is entitled to more? They even denied him of pension as the first executive governor of Adamawa State.